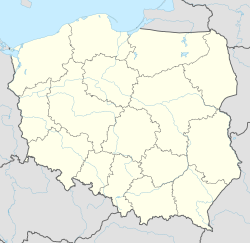 Konstancin-Jeziorna [kɔnsˈtant͡ɕin jɛˈʑɔrna] is a town in Piaseczno County, Masovian Voivodeship, Poland, with 17,566 inhabitants (as of March 2011, according to GUS). It is located about 20 km (12 mi) south of downtown Warsaw and is a part of the metropolitan area of that city. The town was created in 1969 through combining neighbouring towns: holiday resort Skolimów-Konstancin and industrial Jeziorna with a number of villages. The town, a 19th-century health spa, sits on the administrative border of the capital city, Warsaw. The town has an interesting collection of historic villas and new built mansions, a shopping center in a restored 19th-century mill and is the home of the American School of Warsaw. Konstancin-Jeziorna also has a sports team which specializes in football/soccer named Kosa Konstancin created by former professional footballer Roman Kosecki. Wikimedia Commons has media related to Konstancin-Jeziorna. This page was last edited on 20 December 2018, at 21:04 (UTC).